Whew! This is the final part 5 of a five-part series, providing an update on the 5 Disruptions to Marketing as 2018 marches forward. If you have not yet read Part 1: Digital Transformation, Part 2: Microservices & APIs, Part 3: Vertical Competition, or Part 4: Digital Everything, you might want to start there. A recent study by Resulticks found artificial intelligence to be the most over-hyped term in marketing today. And that was with stiff competition from the buzzword bingo of big data, omnichannel, real-time marketing, and personalization. So it’s easy to be skeptical of the term. In Gartner’s hype curve, I think AI in marketing is already starting to peak, with disillusionment arriving quickly. I actually believe that, in general, the frequency of Gartner hype curves are increasing — you can go from the peak of hype to the trough of disillusionment within a year. But that’s an article for another time. But as I wrote earlier this year, the one thing that everybody forgets about Gartner’s hype curve is that, even with the wildly swinging ups-and-downs of hype, the underlying technology continues to advance. 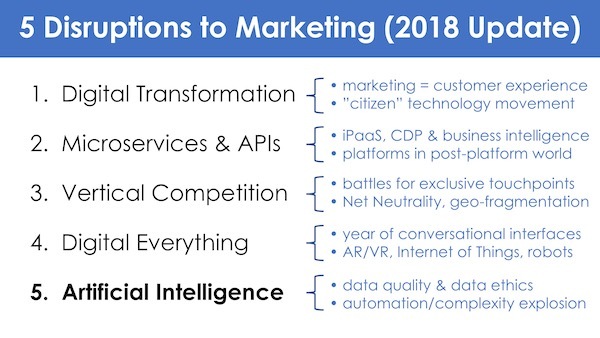 But here’s the irony: as much as the hype has overstated what AI might do for marketing in the next 12-24 months, the reality of how AI is already working in marketing today is often under-recognized. None of these are the kinds of AI supermachines you see romanticized in the movies. They’re mostly statistical algorithms that find and match patterns and then extrapolate them to make predictions. But that’s not a knock against these AI applications though. With today’s data volume and processing speed, these algorithms are highly effective at what they do. For instance, in lead scoring, machine learning and propensity modeling is beating humans and hard-wired, rules-based heuristics pretty regularly these days (here’s one case study that saw a 27% increase in sales as a result). The “natural-language processing” component and most of the algorithms applied in the “machine learning” piece are now at everyone’s disposal: built into messaging platforms, rentable in the cloud for pennies, or simply available as open source toolkits. Where things get interesting with chatbots — their differentiation and competitive advantage — is in the “actions” and “information sources” pieces of the equation. What data and services are unique to your business? That’s where AI shines. This is the single biggest challenge in AI applications in marketing today. Unfortunately, data quality in most marketing systems still isn’t very good. Just a couple of months ago, 83% of B2B marketers in a Demand Gen Report complained that their data is old and outdated. And 71% don’t have time or resources to implement an effective process to improve their data quality — so it’s not getting any better for them any time soon. Feeding that bad data into a good machine learning algorithm won’t give the right answers. And without opening up the black box of the machine learning algorithm, you might not have any idea that those answers are wrong. Other than the poor outcomes you’re getting from it. Bad data in AI isn’t a problem limited to marketing either. In fact, it can be helpful to read some of the latest writing from AI experts and data scientists about the flaws and risks of bad data — in some cases, intentionally bad data — acrosss the field more broadly. Another article by Rhaul Bhargava, a research scientists at the MIT Media Lab, digs into this further with The Algorithms Aren’t Biased, We Are. He explains why, in machine learning, “the questions that matter are what is the textbook and who is the teacher” for the learning that the machine is doing. One starts to realize that data quality and data security will both be intertwined challenges for marketers. Not just data security in the sense of preventing bad actors from stealing your data. But also data security in preventing bad actors from seeding bad data into your systems to knowingly mislead your machine learning marketing systems. Well, it’s mostly about the data. One other factor that we need to keep in mind with machine learning — and frankly, algorithmic marketing of any kind — is the exponentially accelerating speed at which these functions operate. It’s mind-bending. This completely changes the speed and scale of optimization and simulation applications. For a real-world example in marketing, consider MarketBrew, an artificial intelligence platform for SEO teams. Normally, SEO professionals would make changes to a website and have to wait up to 60 days to see how those changes reflected rankings on Google. MarketBrew’s AI engine, however, crawls the web on its own and creates a parallel “Google.” It uses machine learning to develop a fairly accurate model of how Google ranks sites. It can then constantly update this model to reflect changes in Google’s algorithms. As a result, an SEO professional can submit a proposed change to a website to MarketBrew, which is able to give a predicted answer on the impact it will have on rankings within 90 minutes. That’s impressive. Yet still, the model is not reality. Just a good approximation of it. Humans bring context and “common sense” that still elude machine learning algorithms. On the other hand, AI brings greater mathematical accuracy and expontential computational horsepower to bear on problems than our own minds can offer. Together, human and machine are powerful collaborators. One of the biggest disruptions to marketing over the next several years will be learning how to manage those collaborations to their fullest potential. I see everyone is writing about microservice and api, but i guess there will be a big time with AR and VR as well. Great article. AI is very important in content creation marketing.